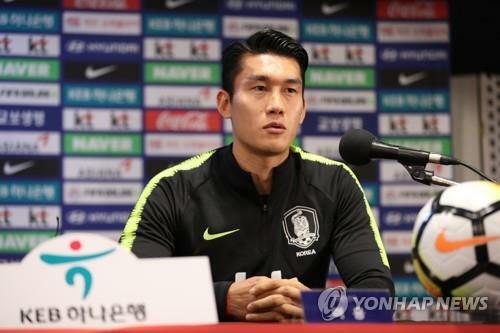 GOYANG, South Korea, Sept. 6 (Yonhap) — South Korean defender Lee Yong said Thursday his national teammates are eager to display their talent to the new head coach and that will lead to good performances in the upcoming friendly match against Costa Rica. Lee is one of the 24 footballers who were selected by Paulo Bento for South Korea’s friendly matches against Costa Rica and Chile. South Korea will first take on Costa Rica on Friday and then face Chile four days later. Lee said the players are set to deliver positive results in Bento’s South Korea coaching debut. The Jeonbuk Hyundai Motors right back, who has 31 caps, said the players are also determined to absorb what Bento teaches during training. Lee, who played in all three of South Korea’s matches at the 2018 FIFA World Cup, said he likes Bento’s approach of telling the players what to do in detail and showing customized methods to make improvements. Bento brought four backroom staff members with him when signing with South Korea. They are chief assistant coach Sergio Costa, assistant coach Filipe Coelho, goalkeeping coach Vitor Silvestre and fitness coach Pedro Pereira.